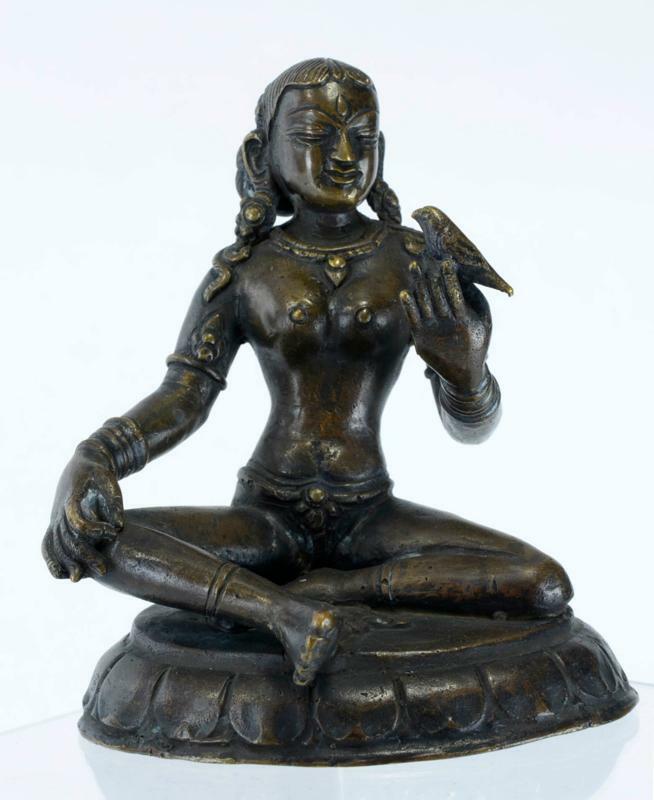 This elegant bronze shows a puja devi or female devotee in a seated position on an oval dais. She is barely attired; her garments largely comprising jewelry. A puja mark adorns her forehead. Her hair is pulled to the back of her head and tied in an elaborately cast bun secured with a flower. Her right hand rests on her knee. The other is aloft and supports a small bird. A related pujadevi of similar size and form is in the collection of and currently on display in the Museo Nazionale d'Arte Orientale, Rome, Italy. It is ascribed to the 17th-18th century. In the past, this image has been described as Saint Andal, the South Indian saint, on account of the presence of the bird and the figure's hairstyle. But the casting, facial features and form of jewelry are more typical of casting work in Nepal. The image has a good patina and is in excellent condition. Pal, P., Indian Sculpture, Volume 2 - 700-1800, Los Angeles County Museum of Art, 1988.